Discussion in 'Server Announcements' started by KingGoldensPanda, Mar 25, 2018. We had another extensive week of updates throughout the server. Im going to try to continue to do weekly update threads, if my time allows, for I think they are quite beneficial for everyone to show what all we have been doing. Marriage is released! /marry help (See photo below!) Hearts in chat show that you are married! PvP Arena's now automatically disable fly, removing any confusion... Staff bypass this. Last minute add: Fixed a major issue where hearts would not load, when married, in chat, after a server reboot. 150x150 island size upgrades no longer requires CLOUD, and is available to everyone! 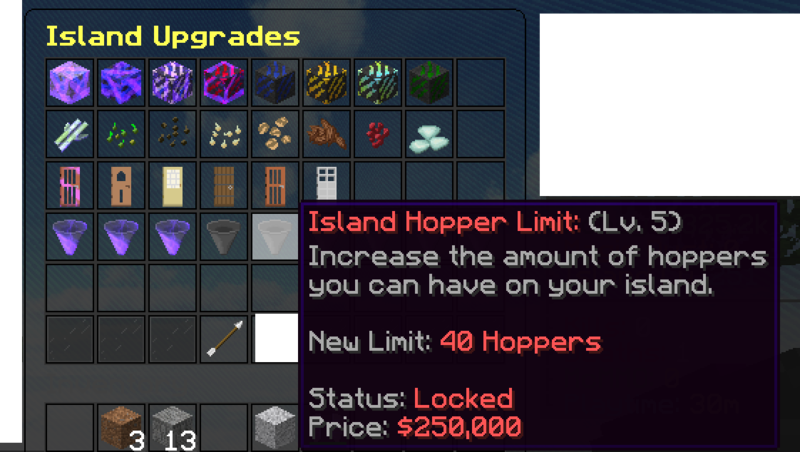 Major update for /upgrade and hoppers, you must now upgrade your hopper limit levels. The maximum level is now up to 75 hoppers on your island (from 60)! Changed thread prefix colors, added 3 new thread prefixes for Survival, Prison, and Skyblock. Combined Survival Server, Prison Server, and Skyblock Server into 1 category, and you must choose a thread prefix defining which server that thread is about, skyblock, prison, or survival. Threads should now automatically close after 45 days of inactivity. Went through and redid all forum's permissions, everything should be correct, still working out some issues. Thanks for the support and playing on our Network! Send some comments below - gives us more motivation! the store still claims that fug+ has /quests . which it does not. and it says that convict+ has basic plot flags. but we have access to no plot flags. and it includes the new survival and skyblock disguises.... which we don't have but i'm gonna assume they're gonna be added yet. /llama and /sheep dont work in mines. it claims to spawn the animals but they're just not there. it's fine in plots. /parrot works everywhere though. I haven't worked on prison yet, note the top of the thread..
yeah. i’m talking about ‘global’ and ‘webstore’ updates so im expecting them to be global and on the webstore lol. also the bugs i reported were from literally months ago and ive already reported them [months ago] so id be expecting them to have been fixed but nope? so im just reminding you. Our goal is to bring you a unique server experience. Through the dedication of our staff, and continuous development of new content, we are able to do this. However, we would never be able to accomplish this without your constant support and generosity. Thank you for supporting us, and we hope you enjoy your time on Royal Legacy! Some add-ons and styles by Apantic © 2015 | Forum software by XenForo™ ©2010-2015 XenForo Ltd.